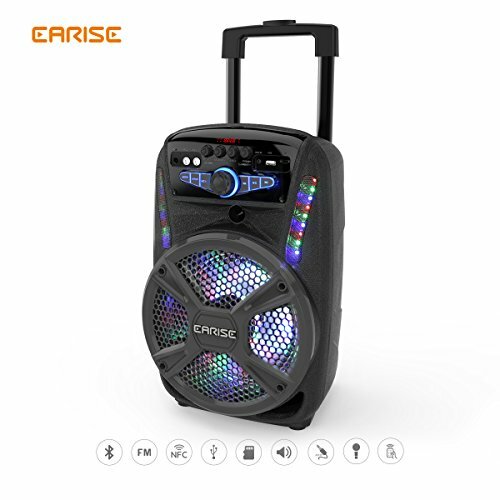 EARISE 15-D/V16-D PA System, cost-effective set included what you need: Bluetooth speaker with telescoping rear-handle and wheels, wireless microphone, remote control, support FM radio function and various connection. With EARISE 15-D/V16-D, just play your favorite music, enjoy the strong bass, clear and rich vocal, makes it filled with your house, bedroom, party, etc. Be your own announcer by using the wireless microphone with the background music to have a passionate speech. Impress your audience with the active LED lights that flashes with the beat of music. Speaker Unit: V15-D: 8"+1" / V16-D: 12"+1"
V15-D: 10.5" x8.8" x16.9" / V16-D:14"x12.9" x23.1"
The stands are compatible with V15-D/V16-D Speakers, not included in the package, please add it into cart individually. The remote control is designed for all types of EARISE PA System, and some button will not be compatible for all models. And it is suggested to use the remote control within 3 meters. You can turn off the LED light by long pressing the "REPEAT" Button as you need. Please charge for more than 12 hours for first time, please keep battery with electric if the battery doesn't work for long time, otherwise the battery will damage. ♪ 2 Size for Options- 8"/12" Speaker, similar functions with 2 sizes, meet your different requirements. You can assemble the stands in the bottom by yourself as you need. The stands need to add to the cart individually. ♪ Low Price with Full Functions- Support Bluetooth/NFC Connection, AUX/Micro SD/USB Input, FM Radio. Enjoy your favorite music in your phone or old music in the CD player. Plug in guitar or microphone to get your friends involved. Make it show time. ♪ LED Light Design- Colorful lights automatically flash as the rhythm of the music changes, making the atmosphere of the party dynamic and boisterous. Sounds great, looks great. ♪ Unique Microphone VIP Function- While music playing and plug microphone, enable to enlarge the voice received from the mic and lower the music volume. Perfect for karaoke, stage performances and Crowd Control. Get ready for your presentations. ♪ Easy to Go- Telescoping Rear-Handle and wheels, easy to move or handle, equipped with wireless and remote control for great convenience. Never worry about the party days. View More In PA Systems. If you have any questions about this product by Earise, contact us by completing and submitting the form below. If you are looking for a specif part number, please include it with your message.